The extremely rugged shock measuring device stores information about the 100 greatest shocks as soon as inclination data. It can be programmed using the function keys and guided by menus, or using special configuration software. The shocks are shown on the display with various parameters and alarm function. Two keys allow to scroll the display content. In addition, the 100 greatest shocks and inclination events are saved in the form of a signal graph to facilitate precise evaluation. The electronic unit is optimsed for long operating periods using standard batteries. 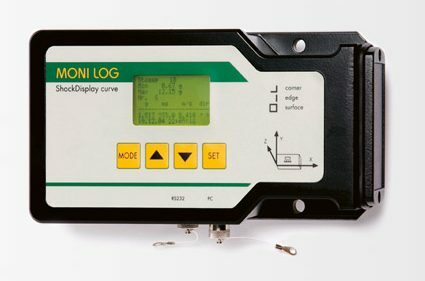 Thanks to the real-time measurement, measured values can also be recorded while data transmission is in progress, so that a real „zero” ms reactiontime can be realized in case of shock events. A very user-friendly software concept was realized in conjunction with the file system and USB interface. The device is mulit-stage password-protected. Employing state-of-the-art technologies makes it possible to manufacture this device at reasonable costs, thereby complying of EC Directives.